Geometra Software AB | 2018-02 And we’re off to a flying start! 2018-02 And we’re off to a flying start! 14 Feb 2018-02 And we’re off to a flying start! In the previous month we looked back on the year that has gone and now time has come to talk a about the present! Mind you, this post is a big one and so is the update we’ve been working on. If you want to just find the latest changes, they’re available at the bottom half of this post and if you’ve got a couple of minutes to spare, we’d love to talk a bit about the feedback process that we run internally. The feedback sent in to us is making an impact on development in a massive way, and we want to show you how we work with it. Read on for more info or jump to the patch notes. We’re continously compiling, reading, sorting and evaluating all feedback that is being sent in, and it is a joy to read! The development plan is keeping good pace with the feedback that comes in and we’re working on quite a few of the issues users have raised over the past months alongside other upgrades and improvements to the application. This version, 2018-02, adresses a total of 38 of user submitted feedback cases. From the introduction of the release cycle we’re currently working with we’ve compiled feedback from version 2017-09 (which was the big upgrade to the PDF-engine). During that time we’ve seen 180 cases being raised through the feedback system that we’ve elevated into the overall feedback statistics, enabling us to track and sort cases and help us with prioritzation. With this we really want to emphasize how important your feedback is to us, and that we read every single piece of feedback that is being sent our way and we also want to encourage you to keep sending in feedback as it gives us a great way improve upon Geometra as a whole. Something you like, something your don’t like or just general thoughts about the service or us – all is welcome! As feedback has come in we’ve tracked these cases on per version basis, this is to help us to track when changes are being made and at which times in the applications lifespan they were raised. Also allowing us to go back and find out how much of cases we’ve been able to implement solutions for. 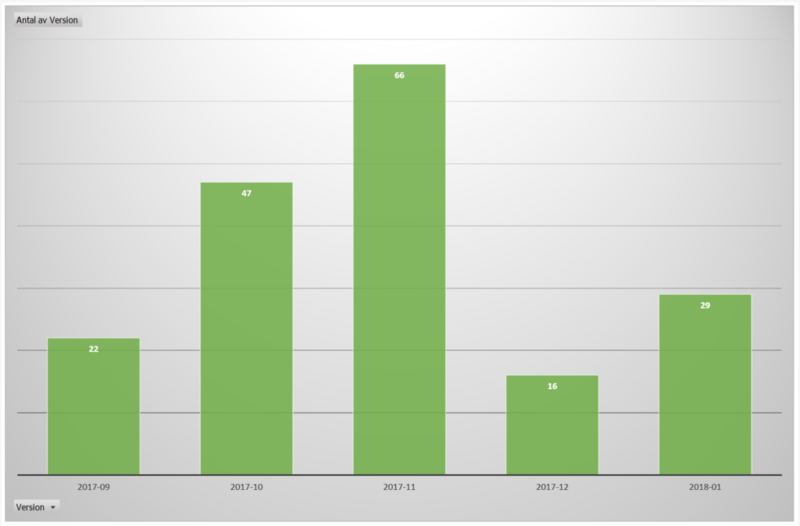 The bar graph below represent the total number of cases per version we’ve recieved. As we go along with development we aim to solve as many cases as possible during each cycle, sometimes we can solve more due to the nature of the cases and sometimes it’ll be less. The most important thing is that we continously solve and implement improvements based on user feedback alongside the planned development work we’ve drawn up for the application. 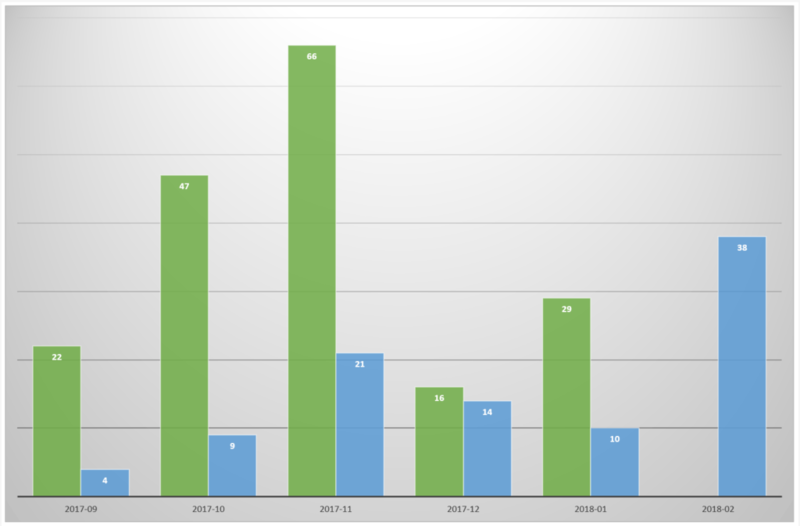 The past releases have introduced several user feedback initiated changes, the bar graph below will show you how many of those cases we’ve solved. The blue bar represents solved/addressed feedback cases. NOTE: The lifespan of 2017-11 was slightly longer, about 9 days, than the rest of these versions due to postponed release as a result of the conference and merging of some major upgrades during development. We’ve reshaped our way of thinking about supporting our users from having in-app support windows to moving them outside to a larger plattform over at https://www.geometrasoftware.com/en/support-en/ which will allow us to easier update and manage the support content and not require application version updates to update the support content. This also lessens the amount of work that developments needs to spend on support content, as it can now be maintained with the help from the support team as well. Please peruse our guides and let us know if there’s anything you feel we’ve missed or if you have a particular way of using Geometra that you would like us to learn from and/or comment on. The guides offered are basic feature overviews with descriptions and we are looking into providing you with more advanced and in-depth guides in the future. If you’ve got any guide requests, send them our way! Last but not least; We’ve been working tightly with our Norwegian agent, TriMax a/s, to get this up and running and we’re happy to announce that our new site is now also available for our Norwegian users! There are some small parts still being translated and polished but all in all, the latest information should now be readily available. Norwegian users trying to access any resources from www.geometra.no will be automatically forwarded to the new site. [Feature] Added a direct link button to the AppBar to launch TeamViewer Support. [Feature] Link to latest news now opens up www.geometrasoftware.com in a new tab and points to latest news. [Upgrade] Major code revisions for this release to reduce clutter, improve performance and stability. [Upgrade] Refactorizations of the AppBar have been made to improve features and performance. [Upgrade] The PDF-engine has been updated and revised, improved stability and increased performance overall. [Upgrade] Change the layout of buttons on the right side of the AppBar for a more cohesive design. [Upgrade] A fresh new background image, a little change never hurt! [Feature] Added the Terms of Service link more visible on the Login View. [Upgrade] Compacted the layout a bit. [Feature] We’ve redesign how inheritance works between different types of Annotations. Every Annotation type has now get a seperate starting point and inheritence cycle. This means that changing the color of an Area Annotation will not affect the inheritance of color for any other Annotation type. We hope this will offer you a better experience and an easier time switching between different Annotation Tools. [Feature] Inheritance has been further reviewed and the following properties should now be properly inherited forward to the next Annotation of the same type. Copy/Paste the ‘Scale’ Annotation between pages and PDFs freely. [Feature] (Early Access) Keeping ‘space’ pressed will now switch to ‘Pan’ allowing for click and drag to navigate the PDF. Releasing ‘space’ will revert to the previously choosen tool again. NOTE: We’re bringing this out earlier than intended as the first implementation seems to work well. This still needs a bit of tweaking. [Feature] Average values are now represented when multiselecting Annotations. NOTE: Please be observant of your current selection when using these as it will not detect different types of selected Annotation, simply dividing the current number of selected with the base values. 1 ‘Area’ and 3 ‘Points’ would in this example be counted as Area divided by 4. [Feature] (Early Access) You can now turn of the Estimation Rows via a new button in the AppBar. This will hide the rows for that session, giving you more space to work on. NOTE: This will currently reset when switching views. It’s been requested by many users so we’re adding an early version of ‘Toggle Rows’. A more permanent solution to follow in coming updates. Switching PDFs via doubleclicking an Annotation on a different PDF will not reset the view. The reset is due to a limitation that is in a larger scope and will require some more development time to get right. [Feature] When doing ‘Area’ and ‘Reduction’ Annotations a dashed square will now be displayed while doing a two-point measurement. This should make it easier to accuratly draw square Annotations. [Feature] Two new buttons have been added for Zoom In and Zoom Out to the AppBar. NOTE: Not the NumPad ‘+’ and ‘-‘, these will resize the UI with the built in browser zoom. [Upgrade] The PDF-frame has decided to come out of the corner and should not be properly displayed alongside the AnnotationSettings and AnnotationRows. (Nobody puts PDF in a corner…). [Upgrade] Large sets up updates to Annotations should now be more fluid and provide a more stable experience. Disconnects while under heavy load have been remedied and we’ll continue to monitor these for more optimizations. [Upgrade] Increased spacing of buttons in the AppBar. The ‘Delete’ button should now be better separated from the other actions to avoid accidental clicks. [Upgrade] It should once again be possible to change color of all Annotations inside a folder. This will also apply to any subfolders in that path. [Upgrade] Downloading a file from the Estimate View will now correctly name the file with it’s proper filename instead of numbers.